Chihuahua City (“chi-WAH’-wah”) is the capital city of Chihuahua state – by far Mexico’s largest state. With over a quarter of a million square kilometers of territory, Chihuahua occupies nearly 13% of Mexico’s total land space. It also shares a long land border with the USA. Although the state capital of Chihuahua provides the eastern terminus of the Copper Canyon train, it has not really been part of the Mexican tourist trail in the past; ignored by some guidebooks and distanced from the cluster of cities in Mexico’s colonial heartland, Chihuahua has been overlooked by many people who visited Mexico’s other colonial cities. It is nevertheless, a very important city in Mexico: its wealth built on agriculture and industry which still thrive here. It’s also one of Mexico’s most important historical centers. Chihuahua’s atmosphere is truly Mexican and deeply patriotic, which adds remarkably to the sense of history found here. Its remoteness from the traditional colonial heartland means that it hosts fewer tourists than its counterparts; although a tour of Mexico’s colonial heritage, without including Chihuahua, would be incomplete. Chihuahua’s colonial center is filled with handsome colonial buildings, mansions and palaces – most are open to the public – and also has some fine museums, including the ex-houses of two of Mexico’s most famous leaders. Surrounding Chihuahua City are a number of areas of outstanding natural beauty which lend themselves to adventure and eco tourism, something the local government here is actively promoting (see Key Attractions). This is a city with an authentic Mexican feel, a friendly atmosphere, important historical significance and a selection of fine attractions. A stay of 1 or 2 nights here, either as part of colonial city tour, an adventure holiday, perhaps as part of a copper canyon train ride, will be rewarded with your discovery of a true hidden gem within Mexico’s rich colonial heritage. The city’s Cathedral overlooks the busy Plaza de Armas (main Plaza) where small band-stand like structures host a series of shoe shiners busy polishing the shoes and cowboy boots that can be seen everywhere here; Chihuahua has a lot of ranches on its outskirts. This is Mexico’s cowboy country. Two imposing buildings greet you at the end of Calle Libertad, a pedestrianized area of shops: The Federal Palace; a fine looking building inside and out that today houses Chihuahua’s main postal and telegraph offices; on the left of it, the back of the Government Palace. Around the corner is Plaza Hidalgo, where a statue commemorating Padre Miguel Hidalgo, one of the fathers of Mexico’s independence movement, stands proudly in the center. The main entrance to the Government Palace is off here. The Government Palace is built in the traditional style with an impressive courtyard surrounded by a series of passageways and rooms; today they are all official government offices. 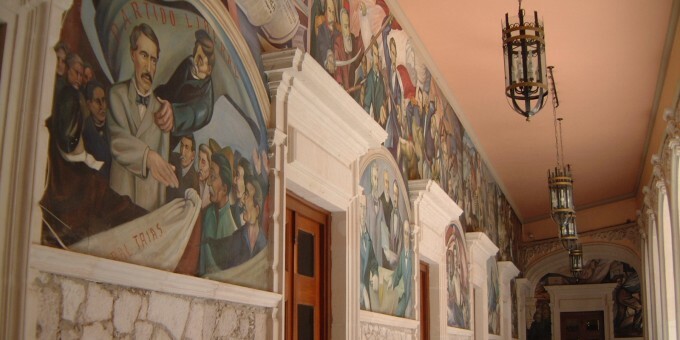 All three levels of the building have public access, and there are fine murals on most of the walls which depict Mexico’s struggle for independence. The Palace is one of the finest in Mexico; it takes a good couple of hours to see the building properly. Paseo de Simón Bolivar (Simón Bolivar was a Venezuelan who led the independence movement in South America) – is a picturesque avenue lined with old colonial villas and mansions and a nice park where families gather to play, eat, drink and relax. Chihuahua has some fine museums. Museo Casa Benito Juarez – Benito Juarez was Mexico’s first president; his home is now a significant museum in the city. It’s small, but has some interesting rooms that give a glimpse into how Juarez lived and worked; many of his famous quotes and sayings are displayed around the museum; he was something of a philosopher as well as a statesman. Museo de la Revolución Mexicana – (Museum of the Mexican Revolution) The museum is in the middle of a residential suburb; it is General Francisco (Pancho) Villa’s old home. In 1982, the building was formally taken over by the state, turned into a museum and inaugurated by President Jose Lopez Portillo. The museum gives a good insight into the life and work of Pancho Villa. Various rooms depict the different eras of Mexico’s history around the time of the revolution with many fine and original examples of tools, machinery, weapons, clothing and technologies of the day. Calabozo de Hidalgo – Calabozo means dungeon and this place, now a museum, is where Padre Miguel Hidalgo and Ignacio Allende were held before being executed by the Spanish for treason. Their heads were severed and sent to be hung on the hooks of the Granary in Guanajuato as a warning to other would-be insurgents. In the Government Palace downtown, there is a special room that is now a shrine to Miguel Hidalgo with a light, representing an eternal flame, glowing inside. By Air – You can get to Chihuahua City by plane from Mexico City, Monterrey, Tijuana, La Paz, and destinations in the USA including Los Angeles, Houston and San Antonio. The airport is about 30 minutes drive from Chihuahua City. A taxi will take up to four people for a fixed fee; buy your tickets at the taxi desk inside the terminal building. If you want to rent a car, agencies have desks inside the main airport terminal building; booking car rental in advance will save you money in comparison to renting on the day (see car rental). For detailed information about flights and flying, see the Mexperience guide to Air Travel in Mexico. By Bus – First class buses run all day every day from Mexico City to Chihuahua and even further north to Ciudad Juarez on Mexico-USA border. Chihuahua has excellent national bus connections and you can get from here to many places south, north, east and west. There are also regular buses from Chihuahua to destinations in the USA. For detailed information about bus transportation read the Mexperience guide to Bus Travel in Mexico. By Car – Driving to Chihuahua City from the southern border of the United States at Ciudad Juarez will take you about 4 hours on Toll Road 45. The drive north from Mexico City will take considerably longer – around 12 hours using the faster toll roads where possible. See additional information about Driving in Mexico and Mexico’s Toll Roads on Mexperience. Local Buses – Local buses are available, but most of Chihuahua City’s main attractions downtown are best experienced on foot. During the last two weeks in May, the city hosts La Feria de Santa Rita, one of the city’s most veteran festivals featuring prominent regional and international musicians, theater, expositions and amusement park rides. Over the years, the city has risen in prominence as a center for sports and adventure competitions and events—not surprising since Chichuahua state offers endless possibilities for the outdoor enthusiast. Besides marathons and bike racing, the state also hosts an Adventure Tourism Festival every July and August. Popular events include mountain biking, adventure racing in the canyons, and triatholon. If you love extreme sports, this is your kind of festival! If you’d like to experience some typical Chihuahuan ranchero (cowboy) culture, you can usually find a rodeo with traditional events such as bull-riding, steer roping and other live-stock based fun. In August, there’s a Country Festival with, what else, country music, rodeos and mechanical rides. The city is also popular for traditional Mexican bullfighting (corridas). 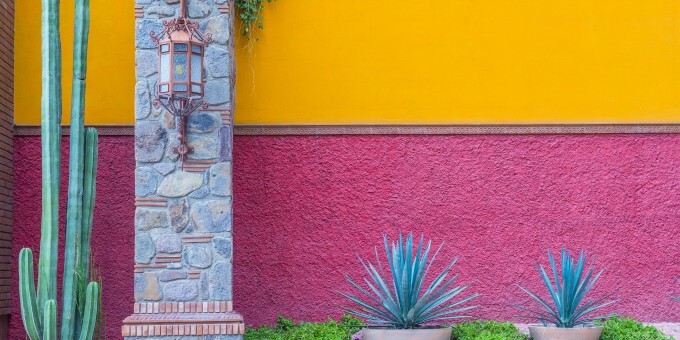 Telephone: Connect to the guide about Communications in Mexico on Mexperience for detailed information about keeping in touch and the latest table of national dialling codes. Exchanging Currency: Banks with ATM machines can be found in the downtown area of Chihuahua City. During business hours, they and the Casas de Cambio will buy traveler’s cheques and cash from you as well. For detailed information about exchanging and managing your money, read the Mexperience guide to Money in Mexico. Locally Hosted Parties – Check with yours and other local hotels about public parties they may be hosting during your stay. Traditional Mexican theme night parties are popular with the locals, and there’s a chance you could join a really special night out – the real Mexican way, and certainly on the eve of September 16th – Mexico’s Independence Day. Hosted parties usually include dinner, dancing, a show and / or live music (usually authentic Mexican Mariachis) plus all drinks for a fixed fee and are always excellent value for money. Ask at your hotel to find out what is happening locally. Nightclub Scene – Most of Chihuahua’s night life happens in the bars and lobbies of major hotels – check locally for details. Cowboy boots can be seen for sale everywhere in Chihuahua. You can buy the real thing here, good quality and in virtually any color you care to mention! There are also a number of stores selling arts and crafts created by the Tarahumara Indians who live in the Copper Canyon as well as Menonite cheese, (“Queso Menonite“) made and sold here and in many other places around Mexico, too. Chihuahua City sits at a reasonably high altitude of 1,500 meters (4,800ft) above sea level. Because of its arid, inland location, it is hot and dry most of the year. Mexico’s rainy season does not really affect this area.